It is uncomfortable to read her account of the decline-and-fall of the once-mighty Kodak camera company, and Blockbuster, the once-ubiquitous movie rental business. In retrospect, both organizations were constitutionally unable to respond to the changing realities of their business environments. They could see that they were going over the cliff, but they couldn’t bring themselves to respond effectively or in time. Collectively they were addicted to the familiar ways that in the end spelled their doom. Consider America. Like a vast super-tanker out on the high seas, the United States seems unable to slow down or make course corrections as it heads toward the rocks. We are running a deficit of a trillion dollars a year, yet we have more or less agreed to normalize this stampede to insolvency. We would rather debate the impact of Mitt’s Mormonism on his ability to carry the red states, or whether Madonna was a good choice for the Super Bowl half-time show. Why? Because we are embedded too deeply in a culture of consumption and entitlement. Think of the human response to the ecological crisis of the planet. Globally, the current rates of consumption of energy and degradation of the environment are simply unsustainable. It has taken us thousands of years to reach our current population of seven billion people; by 2050, it may have expanded to 10.5 billion. But with the slightest sliver of hope that the United States economy may be on the mend, the news from the auto industry is that gas-guzzling SUV sales are nudging back upward. As a society, we have no real intention of changing. Why? Because we are so attached to this way of life that we cannot imagine any other being viable. I’ve seen the same persistence of church cultures too. A church finally dismisses a disappointing and deeply-flawed minister. A search committee is formed to find a successor. But the committee consists of persons who embody the culture of the church, and so they manage to find a new minister who mirrors their own persistent dysfunctions and who actually bears an uncanny similarity to his predecessor. I teach at a seminary that is in the throes of self-examination and, hopefully, constructive re-tooling for a viable future. As an “industry,” seminaries across the United States have been on an enrollment plateau for a long time, and may actually be tilting slightly down in overall attendance. Seminaries may be the academic equivalents of Kodak-Eastman. A shocking proportion of these seminaries are already financially under water, and others are sinking fast. 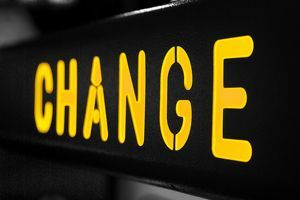 A paradigm shift is imperative, but it is excruciating for those of us who make up the culture to embrace the changes necessary to forge a solid future. We all cling to the familiar, and in our selfish moments hope that seminary Armageddon will be delayed at least until after our working lives. The gloomy biblical prophet Jeremiah once asked rhetorically, “Can the leopard change its spots?” The answer, of course, is no. Unfortunately, institutions are a lot like leopards. Yet that is not always true, and it is never Christianity’s final answer. One of the shining features of the Christian faith is hope—including the hope of real change of human hearts and dispositions, and real changes of individual and collective direction. The future is open-ended. With God’s help anything is possible. But it usually requires leaders who see what is coming down the track toward us, and plan accordingly. As the ancient Book of Proverbs says, “The prudent see danger and take refuge, but the simple keep going and pay the penalty” (Prov. 22:3). Sociologists have long known that changing corporate or institutional cultures—mindsets, if you will—is very difficult work. The best incentive for change is terrifying crisis—the imminent threat of annihilation. That has a way of concentrating the mind, but by then it can be too late. By that point the current on the river has quickened, and the roar of Niagara is directly ahead. One Response to Can Institutional Cultures Change?